If I can bake today, I have to thank my mom, who was a wonderful cook and baker. Unfortunately most of the things she cooked and baked were not from a scratch and, actually, that's where I stepped in as soon as I was big enough to help in the kitchen. If she wanted to make something from scratch, she would pass the task to me (exception are very few of her favourite recipes that I will probably blog about in the future). My mother passed away 12 years ago, and what I have left is her recipe notebook, that I keep as the most precious memory. There aren't that many recipes in it, but they're all tried and guaranteed success. 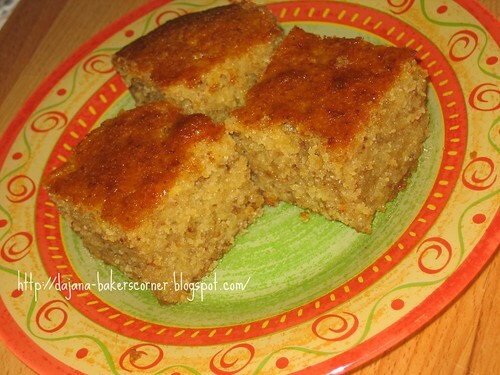 A couple of weeks ago, I came upon a recipe for a greek cake called Revani on blog Il mondo di Luvi - she has some very interesting recipes, and that recipe reminded me of my mom's "Greek baklava". I know it has little to do with a real baklava, and I have no idea why she called it that way nor where she got it from, but I do remember clearly that she made it quite often and that we all liked it. I told Luvi I would try to make it soon, so that she could compare the two recipes. That's how my mother's recipe book made it to my blog, she more than deserved it. Whisk the eggs with sugar. Start adding all other ingredients, one at time. Pour the batter into a greased and floured baking tin (round or square). Bake in an oven preheated to 180°C. I really forgot to watch how long it took to bake it, but basicly I waited till it became light brown and checked with the toothpick when I thought it was ready. NOTE: I halved the recipe, so I baked the cake in an 8 1/2'' cake form. While the cake is still in the oven, prepare the syrup. Bring water and sugar to boil, add lemon and vanilla extract, and remove from heat. 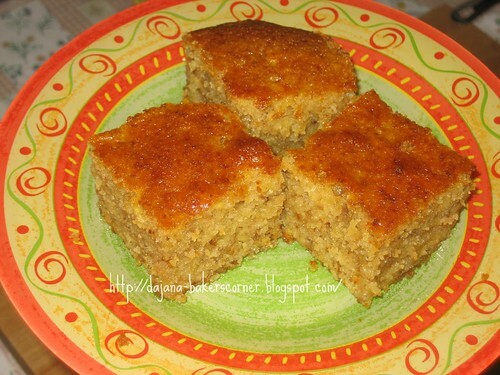 Leave the cake in the tin, cut it into squares and pour the syrup over it. Both cake and syrup should be warm. Let it cool completely before serving. It's even better if you leave it rest overnight. I used Extra Virgin Olive oil for this cake and that gave it a strong flovour, apart from making it a bit healthier than if it was made with butter or other oils. 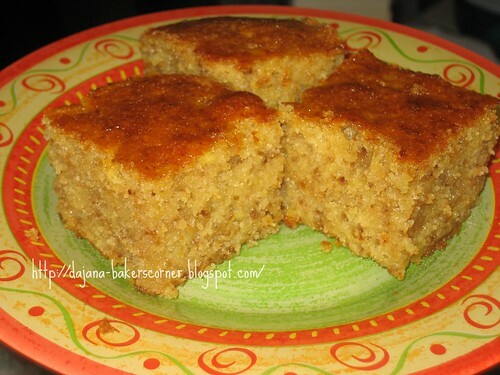 Nuts, grated apples and especially semolina give it a particular crumbly texture, and the syrup adds some moisture without making it too sweet. I guess next time I'll add some grated lemon rind to the batter as well. The characteristics of my mom's recipes is that there are no instructions, just the ingredients list, so I had to work it out myself, pretty much following my common sense and knowledge I have about baking, but it turned out well. The thing that surprised me most is that my husband liked this cake a lot. I would have never expected it. Now I know I'll be making it more often. And I'd be happy if you did, too. Sbattete le uova con lo zucchero e aggiungete uno alla volta tutti gli altri ingredienti. Versate il composto nella teglia imburrata e infarinata. Cuocete nel forno riscaldato a 180°C finché la superficie non diventa ben dorata, controllate con lo stuzzicadenti. Nel frattempo preparate lo sciroppo, facendo bollire l'acqua e zucchero. Aggiungete la fettina di limone e l'estratto di vaniglia. Quando la torta è cotta, toglietela dal forno e lasciate raffreddare qualche minuto. Tagliatela e versate sopra lo sciroppo ancora caldo. Lasciate raffreddare completamente prima di servire, sarà ancora migliore il giorno dopo. e nonostante possa sembrare troppo dolce, credetemi, non lo è.
CONSIDERAZIONE: Ho preparato solo metà dose, e quindi ho cotto il dolce in una tortiera di diametro 22 cm. Se preparate la dose intera usate la tortiera piu grande. Se volete una ricetta più greca, visitate Il mondo di Luvi e la sua ricetta per Revani. Umutite jaja i šećer, pa dodajte ostale sastojke, jedan po jedan, miješajući dobro žlicom ili drvenom kuhačom. Ulijte u namašten i pobrašnjen kalup i pecite na 180°C dok ne poprimi svijetlo smeđu boju. Kad mislite da je pečen kontrolirajte u svakom slučaju čačkalicom (ubodite kolač u sredinu i izvadite, čačkalica mora biti suha). Kad je kolač skoro pečen, prokuhajte vodu i šećer, dodajte ekstrakt vanilije i limun. Pečeni kolač ostavite u kalupu, nakon 10-ak minuta narežite ga na kocke pa prelijte sirupom od šećera. Ostavite da se potpuno ohladi. Bit će još bolji ako prenoći. BILJEŠKA: Ja sam prepolovila recept i ispekla ga u kalupu promjera 22 cm. Ako pravite punu mjeru, koristite veći kalup. I really want to try this...it looks so moist and delicious...and a sweet dedication to your mama :) Thanks for sharing with us! You are so lucky to have your mom's notebook! I'm sure your daughters will treasure it one day! The cake doesn't look anything like baklava which is great for me because I don't like it! This cake looks soo yummy and moist! what a lovely story :). Your moms Greek Baklava looks wonderful! That looks so moist and delicious!!! I love your plate too!! Mm this dessert looks just delicious, and it does look like revani to me. Much loved in Turkey, my country as well. *Michele, I don't like baklava, either. *Bob, baklava is baklava, probably with slight variations made in Turkey, Greece, and in Bosnia, as well (which having been a part of Turkish Empire for 6 centuries has a cuisine greatly influenced by the Turkish one). However this cake really isn't a baklava at all, but I wanted to keep the name my mother gave it just the same. This looks so moist and delicious, what a lovely tribute to your mom! Is a bag of baking powder 15grams there too? Yes, Angie. I usually buy Dr Oetker's baking powder and it's 15 or 16 g a bag. mmmmm this looks good! I love anything that is close to baklava - I have a recipe kicking around for a bacon baklava somewhere. Your mom would be so proud of you! Ha un aspetto delizioso questo dolce,dolcissimo anche il ricordo di tua madre. Ti aspetto da me per un premio!